There are four weekly award winners from the WCHA each Monday of the college hockey season. This go-round, three of them were claimed by Michigan residents. Michigan Tech defenseman Keegan Ford, Northern Michigan netminder Atte Tolvanen and Lake Superior State defenseman Jacob Nordqvist were all honored by their college hockey conference today. Ford, a senior blueliner for the Huskies, was named the WCHA defenseman of the week. The Waunakee, Wisc., native tied for the conference lead among all defensemen with three points, helping MTU to a weekend road sweep of Alabama Huntsville. Ford set up the game-winning goal both nights, while also blocking three shots and recording a +2 rating during the trip. Tolvanen, a senior netminder for the Wildcats, was honored as the WCHA’s goaltender of the week; an award he’s certainly won before. 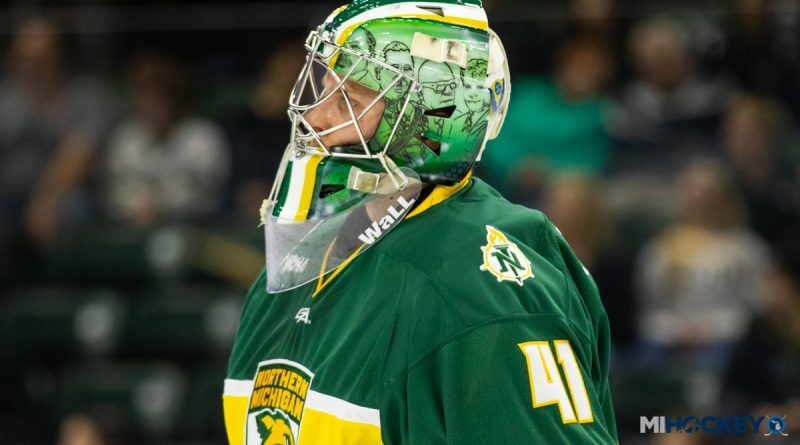 To earn his ninth career honor, Tolvanen helped NMU to a weekend split with then No. 9/10 Bowling Green. After stopping 24 shots in a 3-1 loss Friday, he stopped all 35 shots sent his way on Saturday for his 10th career shutout – second-most in Northern Michigan program history. Nordqvist, a freshman defenseman for the Lakers, was named the WCHA rookie of the week, after tying with Ford for most points on the blue line. The native of Gothenberg, Sweden scored the game-winning goal in LSSU’s 5-2 victory over Michigan on Friday, then added a pair of assists Saturday in a 5-3 loss. His +4 rating tied Ferris State’s Cooper Zech for the NCAA rookie lead on the weekend.